It's all the monitor you really need at a price you can afford. What more do you need? We've already riffed on the global financial meltdown, highlighted Gordon Brown's various failings and discussed the concept of economies of scale. So, before we get too intimate with this rather snazzy looking little BenQ G2200HD 22-inch monitor, we may as well keep the Economics 101 course going with a quick chat about the principle of diminishing returns. Our story begins about a year or so ago when the monitor industry changed course, almost as one entity, in favour of 16:9 aspect ratios and full, high definition 1080p resolutions. At the time, we were bombarded with predictable platitudes concerning the immense benefit of adopting the wider aspect. It soon became clear that the reality was that the change allowed manufacturers to squeeze a few more LCD panels out of a given amount of substrate. Still, the upside for all of us has been lower prices than ever. However, the other part of the strategic change – the shift to 1080p – has been rather more ambiguous. That's because 1080p refers to a grid of 1,920 x 1,080 pixels. For exisitng 23 and 24-inch 16:10 aspect monitors, that actually meant a slight reduction in pixel count, down from 1,920 x 1,200. Given that most desktop duties, such as document editing and web browsing place a premium upon vertical screen real estate, that's hardly ideal. But in the 22-inch segment, 1080p is a clear upgrade from the 1,680 x 1,050 resolution of 16:10 panels. It also means that 22-inch panels now typically match 23 and 24-inch models in terms of native resolution. And that brings us back to the question of dimishing returns. You have to ask yourself whether an inch or two of additonal panelry is worth paying for, if it doesn't actually give you anymore usable desktop space. You may feel it comes down to your usage model: If you mainly play games and watch movies, you will want a bigger screen; If you're a web junky, more screen space is a boon. However, In practice it's more complicated than that. Indeed, some people actually prefer the tighter, sharper image quality in games that results from cramming the same amount of pixels into a slightly smaller space. 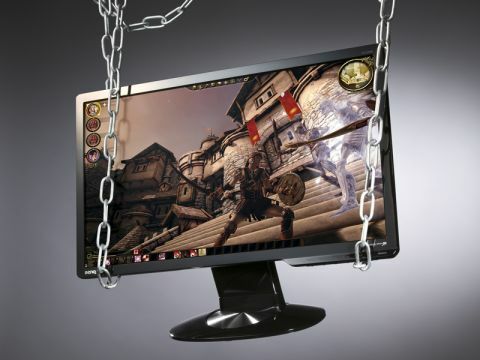 If that's the case, you'll love BenQ's G2200HD monitor. Current games running at 1080p look so sharp on this screen that you'd swear your retinas are at risk if you peer too closely. We were also impressed by this screen's default colour balance. It's probably closer to the correct calibrated colour space than any other screen we tested this month. Indeed, after screen calibration it turned out to be right on the money with measured 6,500k temperature and 2.2 gamma values. What's more, in our subjective tests, it delivers reasonable detail in the white and black contrast scales, decent pixel response, good colour saturation for a TN panel and no evidence of visual nasties, such as input lag or inverse ghosting (at least, the latter is true so long as you disable BenQ's AMA overdrive tech in the OSD). There are no horror stories here. It's also one of the slickest looking screens on test. In short it's compact, classy and offers full 1080p HD for just £125. At this price point, it's all you could reasonably ask for.